President Elizabeth (Beth) J. Stroble speaks to attendees at the Stand with Students event held on campus. Webster was one of five universities lauded for helping students succeed. Webster was identified in a study conducted last year that investigated students from underrepresented populations who attended colleges and universities in Missouri and Southern Illinois. The underrepresented groups were defined as students from low-income homes, students who identify as an ethnic minority, or students who are the first in their families to attend college. Success, in Webster University’s case, was defined as higher graduation rates and lower amounts of student loan debt than the national average. That study was the focus of Friday’s meeting, which was held on Webster University’s home campus and attracted about 200 representatives from regional businesses and institutions of higher education. St. Louis Graduates was founded in 2009 with the goal of boosting the college attendance rates of students from underrepresented populations. A previous study by the St. Louis Regional Chamber of Commerce predicts that about two-thirds of all jobs in the region will require some type of college degree by 2020.
gathered for the Chamber event at Webster. The study was jointly commissioned by St. Louis Graduates and the St. Louis Regional Chamber of Commerce in 2016 and was conducted by the Illinois Education Research Council. It analyzed 20 four-year institutions in Missouri and Southern Illinois for graduation rates for ethnic minorities, percentage of students who receive Pell grants (which denotes coming from a low-income home), the number of student who are the first in their household to attend college, and average student debt loads at the time of graduation. According to the study, approximately 44 percent of the students at Webster University identify as being either black or Hispanic, 38 percent are Pell Grant recipients, and 33 percent are the first in their families to attend college. The study also concluded that Webster students graduate at a higher rate than the national average, but with lower debt than a typical student. The Transition and Academic Prep Program, which helps high schools students or college transfer students with less than 30 credits transition to a four-year environment. The graduation rate for TAP students is now higher at Webster University than the rate for Webster students not in the program. Financial Aid that is granted to nearly 95 percent of all incoming undergraduates. This aid does not include student loans. On average, Webster awards $9,979 in aid to each student, or nearly $8 million annually, the study says. The Financial Literacy Program which helps students with budgeting, managing debt and other common accounting practices. This helps keep Webster University’s default rate (the percentage of students who do not pay back student loans) to 4.3 percent, well below the national average, the study says. Free Metro passes to all students to covers the complete cost of riding the regional bus and metro system. This helps lower transportation costs for students. The University’s commitment to an inclusive environment for all students. 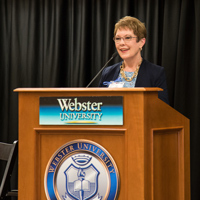 Webster University created a new leadership position – the associate vice president of diversity, inclusion and community engagement – specifically to address strategies to create a more welcoming campus. The other universities and colleges also praised for serving underrepresented students were Maryville University, Missouri State University, Southeast Missouri State University, and University of Central Missouri. In the second phase of the study, 3-5 administrators and a focus group of 4-8 underrepresented students from each of the five institutions were interviewed. The interviews were analyzed to identify converging themes that helped students complete their academic programs. 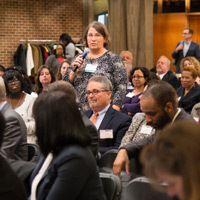 University Leadership – specifically leadership that sets as institutional priorities inclusion, assistance programs, and professional development in how faculty and staff can help underrepresented students succeed. Coordinated and caring communities that offered individualized support to students and easy access to professors. Early college experiences that helped students bridge the transition from high school or a community college to a four-year program. Flexible and sufficient financial aid coupled with numerous scholarship opportunities, institutional policies to keep tuition increases low, and money management workshops for students. Academic support, from writing centers to tutoring resources. 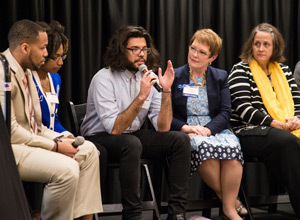 During Friday’s symposium, a panel of students and administrators from the five schools discussed various aspects of the themes. Stroble talked about the leadership structure at Webster. The full report, titled “Degrees with Less Debt: Effective Higher Education Strategies for Underrepresented Student Populations” can be found online at http://ierc.education/ierc_publications/degrees-less-debt-effective-higher-education-strategies-underrepresented-student-populations-2017-2. To learn more about St. Louis Graduates, visit http://www.stlouisgraduates.org.